The material on this page appears in the MGM/United Artists Pressbook for 'A Stranger Is Watching'. This booklet would have been provided to theaters to aid in their promotion of the film. 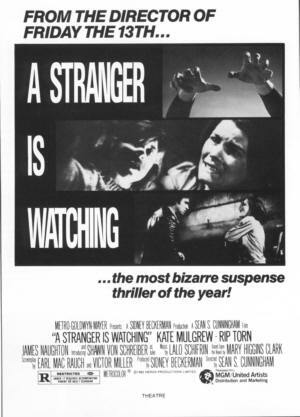 'A Stranger Is Watching' Story Of High Terror and Suspense! In the dank, cavernous catacombs beneath New York City's Grand Central Station, a psychotic murderer holds two terrified hostages—the little girl who witnessed his brutal killing of her mother two years before, and the female television newscaster who has made a popular cause of the death sentence imposed on the innocent man who is to die for his crime. The picture was produced by Sidney Beckerman and directed by Sean Cunningham from a screenplay by Earl Mac Rauch and Victor Miller, based on the novel by Mary Higgins Clark. It will open___at the _____Theatre. It is being released in the United States and Canada by MGM/United Artists Distribution and Marketing. Starring in the picture are Kate Mulgrew, Rip Torn, James Naughton, and Shawn von Schreiber is introduced in the role of Julie. Lalo Schifrin composed the score for the film. “A Stranger Is Watching” was filmed entirely in the New York metropolitan area including Grand Central Station, a shuttered Post Office in the West Village, a midtown sound studio, an executive suite in the Time-Life building, Riker’s Island Correctional Facility, a railroad yard in the borough of Queens and a tiny home in Queens. New York's Grand Central Station, once known as the crossroads of a million private lives, emerges again in a starring role in MGM’s -‘A Stranger Is Watching.” The film's plot calls for psychopath Rip Torn to kidnap television newscaster Kate Mulgrew and eleven-year-old Shawn von Schreiber, drag them through Grand Central and keep them prisoner in a tiny room in the catacombs beneath the station. Star Kate Mulgrew, kidnapped by “psychopath” Rip Torn and held prisoner in a tiny room in the catacombs beneath Grand Central Station, is used to harrowing experiences. As the star of the TV series, “Mrs. Columbo” and “Kate Loves A Mystery.” Kate was involved in many brushes with death. Her role in “A Stranger Is Watching” was not exactly a fun-filled one either. In the film she is kidnapped by psychopath Rip Torn, manacled to a post, constantly menaced and then knifed and left bleeding. Eleven-year-old Shawn von Schreiber, who makes her film debut playing Mulgrew’s fellow victim, is an intelligent young lady. A student of Public School 6. Shawn is a member of the school's Intellectually Gifted Class Program. 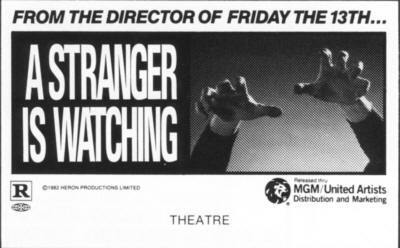 Young, talented Kate Mulgrew, familiar to millions of television viewers, now stars with Rip Torn in MGM’s ‘A Stranger Is Watching.” a motion picture of high terror and chilling suspense, which will open______at the _____ Theatre. The picture is being released in the United States and Canada by MGM/ United Artists Distribution and Marketing. Kate first became popular with television viewers in the role of Mary Ryan in the popular daytime drama series, “Ryan’s Hope.” She went on from there to star in the title role of “Mrs. Columbo’ and then “Kate Loves A Mystery”. “It's not exactly a fun-filled role,” Mulgrew continues. I'm involved in a death struggle with him. Its quite different than Mother Seton,” she admits with a broad smile, referring to another of her roles. But whether she is playing a religious leader or a woman goaded into violence, Mulgrew seems to be a director's delight.